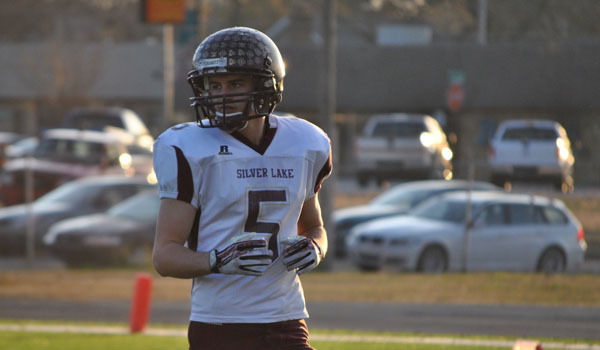 In a battle of two of the premiere programs in Kansas High School Football, Silver Lake shut down the Holton wishbone attack in claiming an 18-7 win. The Eagles, ranked No. 1 in Class 3A, took a 6-0 lead in to the break after Zach Boyd scored from 1-yard out in the first quarter. Holton drove to the Silver Lake 10-yard line in the third quarter before turning the ball over on downs. The Eagles would respond with a drive that ended in a 45-yard scoring strike from Ryan Matzke to Jace Freeman to build a 12-0 lead. Holton would answer quickly as Justin Rieschick returned the ensuing kickoff 94 yards to the Silver Lake 5-yard line. Indie Allen would score four plays later from a yard to pull the Wildcats within 12-7. Cody Renfro added a short touchdown run in the fourth quarter to put the game out of reach for the Eagles. Holton was held to 116 yards rushing on the night. Many believe that Olathe North is the state’s most talented team. The Eagles expected a challenge in opening their schedule at Rogers-Heritage (Ark.) and they got it. Olathe North scored on a Venus Triplett 8-yard touchdown run with :44 seconds remaining to beat Rogers-Heritage, 18-13. In a match-up of No. 4 teams in Class 6A and 5A, it was the Maize Eagles knocking off defending 6A champions Derby, 20-13. Connor Lungwitz hit Gabe Chavez on a 5-yard touchdown pass to break a 13-13 tie and give the Eagles the win. Lungwitz threw for three touchdowns on the night for the Eagles. Curtis Whitten led Derby with 125 yards rushing and a touchdown. Hunter Knoblauch rushed for more than 220 yards and two touchdowns as Andale built a 29-0 lead en route to a 41-20 win over defending 4A champion Buhler. Hank Eck added three scores of his own as part of his 100-yard night. Buhler moved the ball well behind junior quarterback Jace Williams, but found points harder to come by. Williams rushed for more than 200 yards and passed for more than 150 yards on the night. Buhler, preseason No. 4 in 4A-I, lost to the Indians for the third consecutive season. Week one featured several overtime games. Through four quarters, Prairie View and Wellsville had played to a scoreless tie. In overtime, Prairie View got the ball first but had to settle for a Cosy Scott 33-yard field goal. On Wellsville possession, the Eagles fumbled the ball into the end zone where the Buffalos recovered to secure the 3-0 win for Prairie View. Elsewhere, one overtime wasn’t enough for Larned and Hoisington. The two newest members of the Central Kansas League finished regulation tied at 8. Larned scored first in overtime, but the conversion attempt was no good. Hoisington suffered the same fate on their possession forcing a second possession for each team. The Cardinals scored first to take a 20-14 lead, but Larned would get in the end zone again and kick the PAT for a 21-20 win. Rod Stallbaumer’s first game as head coach at Basehor-Linwood will be a memorable one as his Bobcats picked up a 20-17 overtime win over Baldwin. After a scoreless first half, the Bobcats and Bulldogs ended regulation tied at 14. Sophomore quarterback Justin Phillips scored from eight-yards out to provide the winning points for Basehor-Linwood. In Class 2-1A, top-ranked La Crosse held off No. 3 Olpe 28-8, in a game played in Newton. The Leopards took a 6-0 first-quarter lead on a touchdown run by Sheldon Schmidt, and extended it to 14-0 on a 55-yard touchdown pass by Jack Garcia. Olpe answered back by returning the ensuing kickoff for a touchdown to pull within 14-8. From there, La Crosse would tack on a pair of scores on a 34-yard pass from Garcia to Andrew Jay, and Schmidt’s second rushing score. The teams would play a scoreless second half as the Leopards held on for the 28-8 win. The fan’s choice for Kpreps Game of the Week featured two ranked team in 8-Man, Division. Fifth-ranked Spearville scored on a Brandon Davis 26-yard run with under 40 seconds to play to upset No. 1 Madison, 32-28. Madison built a 14-0 lead in the first half before Spearville tied things up at halftime. After three quarters, the Bulldogs and Lancers had traded touchdowns and the game stood even at 20 heading into the fourth. Spearville took its first lead 26-20 early in the fourth quarter. Madison would answer with a touchdown and two-point conversion to take a 28-26 lead with 3:14 remaining. But Davis’ late touchdown would propel the Royal Lancers to the win and into the state spotlight in 8-Man, Division I. Defending 8-Man, Division I champion Osborne knocked off 8-Man, Division II top-ranked Thunder Ridge, 52-28. The Bulldogs, ranked third in Division I, built a 24-8 lead in the second quarter before two Trent Rietzke touchdown runs pulled thunder Ridge to within 24-22. Osborne would add a score before half to lead 32-22. The second half belonged to the Bulldogs aside from a Rietzke 74-yard kickoff return for a touchdown. He finished with 197 yards rushing and scored all four Longhorn touchdowns. Jake Tiernan led Osborne by completing 18 of 25 passes for 217 yards and four scores. He also rushed for 93 yards on 14 carries. Senior Brandt Wolters caught eight passes for 79 yards and two scores for Osborne.